The Chocolate Studio is design studio for chocolate as an element. 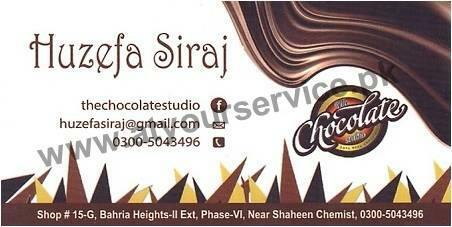 The Chocolate Studio is located in Bahria Heights II Ext, Phase VI, Bahria Town, Islamabad. The Chocolate Studio is design studio for chocolate as an element. The finest Belgium chocolate which you can customize in any from and shape.